First Stretch: Campo to Julian. The Desert. First Stretch: Campo to Julian. Day 1: Campo to Lake Morena. 20 miles. After spending the night in the dirtbag hotel (a.k.a. our truck), we drove up to the southern monument of the Pacific Crest Trail. I've seen this monument a thousand times in pictures, but it was very surreal to be touching it in person. The first people we met were Ika and Liz, who were just as amazing as everyone else we've met in the hiking and climbing communities. That felt good. It felt familiar. I left the southern terminus full of nerves and psych, feeling a tad overwhelmed with what I was getting myself into. The downside to telling everyone you're going to hike 2,660 miles, is that they expect you to hike 2,660 miles. Could I make it? What if I couldn't even make it to the Sierra? What if my knees start acting up? Wait, WAS THAT A TWINGE OF KNEE PAIN?!! 1 of... Wait, how many? As I was starting the trail, I saw people making smart decisions like chugging Monster energy drinks. Two guys that had set off chipper were nursing blisters two miles down the trial... maybe I'm more prepared than I think. There was water everywhere along this stretch, so the hiking didn't feel like the desert yet. Most seasonal streams were flowing, but my inexperience in the desert made me carry four liters of water from the start out of fear. Nobody wants to call in a rescue on day one. 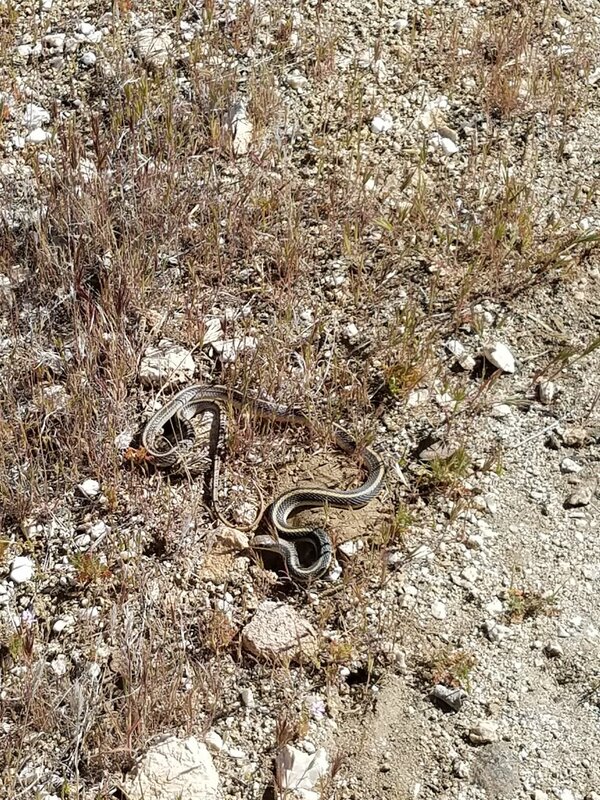 These harmless little guys were sunbathing all over the trail. I started the day planning to head to Hauser Creek, 15 miles away from the border. Hauser has a notorious steep climb after the creek that's baking in the sun all day, so I had been recommended to camp at Hauser and then do the climb the next morning, when it's cool. So naturally, I hit Hauser at 2 p.m. and headed straight up the hill. It was unexpectedly hot, but the excitement of starting my journey kept me chugging along. I passed a few hikers that I would camp with later that night. Nobody was very happy. One couple seemed like their relationship was on the rocks, a common side effect of death-marching your sweetie up a hill in the blazing sun. The big climb out of Hauser Creek. I reached Lake Morena at mile 20 without too much fuss. The new shoes I had been wearing (Altra Lone Peak 3.0) weren't as broken in as I perhaps needed them to be, and the pads of my feet were protesting. There was a group PCT campsite where everyone was bent over and limping around. Made me feel a bit better that I still felt alright. There was a good group of people all sitting around, talking about the start of our journey. One girl was quitting already! I suppose talking about the PCT can be more glamorous than walking uphill and filtering the horse spit out of your water. One guy was from Korea and didn't speak any English. A bottle of Fireball whiskey emerged from his pack to share with everyone, but didn't know it was cinnamon flavored. He only knew the word 'whiskey', and not the 'cinnamon' that preceded it. He didn't like it. Enjoying (?) some sips after a hard day. Day 2: Lake Morena to Burnt Rancheria. 22 miles. 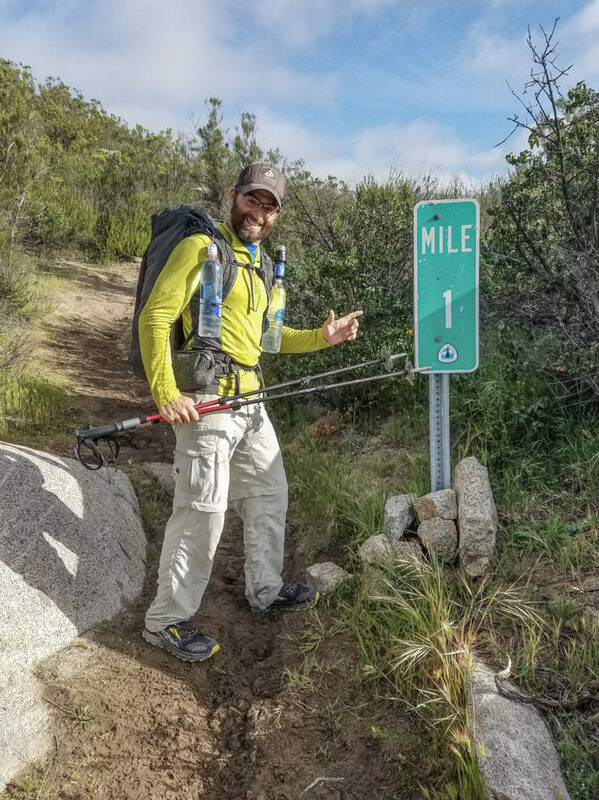 When I left Lake Morena around 7 a.m., just about everyone had their goals set on making it to Burnt Rancheria in Mount Laguna, CA. This might have been a lofty goal, seeing as how that day's 20 miles were going to be mostly uphill... and this was the first time most of us had attempted to hike 20+ miles, two days in a row. So I set off alone and started hacking away at the miles. I felt great, but my feet were SO tender from the day before. I sent a message to Mel to start looking at insoles (isn't technology ridiculous?). Hiker hunger kicked in really hard that day. I hadn't had much of an appetite the day before because of nerves, so I had my lunch from the day before still in my pack. For lunch I ate the lunch I planned, the previous day's lunch, and then three nights worth of dessert... I hadn't packed enough food. I met an amazing couple named Kevin and Samantha. They were doing a training hike preparing for their PCT permit date in a couple weeks! I talked with them about living in Bishop and what my strategies for the Sierra were. Where to camp the night before summiting passes, what gear choices I'd made, how to cross rivers etc. all came up. After they suggested a couple trail names (Golden and FreeSolo), the one that's going to stick might be 'Beta', which in climbing lingo means 'the lowdown on how to climb a certain route, often down to nuanced details'. It also works right into my PCT Instagram account, @hikerbeta! Too perfect. I hope I see Kevin and Samantha down the line. The rest of the day wasn't too crazy. I crossed the I-8, the first major interstate crossing. Saw a baby rattlesnake, maybe only six inches long (Kevin almost stepped right on it!). The landscape shifted from desert into pine trees as I climbed the 3000 ft up into Mt. Laguna I was dragging feet as I crawled into Burnt Rancheria campground. It was dusk, and there was no sign of anyone else. The campground was still closed for the winter and it was cold up there. Temps dropped to around 35F with 20 mph winds all night. Every layer I had with me was barely enough. The closed campground had bathrooms and water faucets, but everything was locked/off. My alcohol stove wasn't working well in the high winds, so I had to belly up to the wall of the bathroom to cut the winds down enough to boil some water for my exciting teriyaki rice sides! Using the closed bathroom building to shield myself from the wind. Nobody else ended up being able to make it up to Burnt Rancheria, so I slept alone in the ghost town campground, just barely warm enough (or maybe just exhausted enough) to get some sleep. Day 3: Burnt Rancheria to Chariot Canyon Road. 22 miles. The weather had calmed down in the morning, but it was still super cold. I waited until the sun came up before I emerged from my tent. Water was on my mind. I had expected there to be some water in the campground... but there wasn't and I was running on empty. I started my hike and headed toward two semi-reliable water sources. If those were dry, I'd have to backtrack into the little town of Mt. Laguna to fill up on water. Luckily, there was a water faucet (which was off) and a concrete cistern that had some semi-clean water in it. The water was limited, so I only took a liter and thought I'd try my luck with the next source. A short ways down the trail, I found a campground with the water on! I filled up all four liters to prepare for the long, dry day. I only passed two water sources the entire day. One was a full, but scummy water tank in Pioneer Mall (a strange little walk with memorial plaques and graffiti everywhere), and the next was a seasonal stream that was actually really good, clear water. Odd memorial plaques among the graffiti at Pioneer Mail. During lunch I made the mistake of drinking water from the concrete cistern without filtering it. I had accidentally filled up one of my 'clean' water bottles with the dirty water without noticing. I took a nice swig of algae water before I realized the taste was off and there were little pebbles in the bottom of the water bottle... oops. I mentally calculated when the next time was that I could be permanently stationed on top of a toilet, inventoried my anti-diarrhea pills, and set off down the trail again. Trail gods, keep the giardia away, please. The views were amazing all day, overlooking the desert below. I wanted to get as far down the trail as I could. Melanie's birthday was the next day, so I wanted to be able to quickly get into Julian the next morning. All I could muster was 22 miles though. Most of the day was downhill, but my foot pads were so incredibly tender, I had to stop for the night. I still had 14 miles to go until Julian. Seasonal stream where I loaded up on all the water I'd need to get to Julian. I ended up camping near Chariot Canyon Road next to a few people, but I was too exhausted to be social. As the sun went down, I was already in bed. But then I woke up to barking. High pitched, panicky, angry fits of barking. It started far away, but got closer and closer and closer. Silence between every fit of barking was long and creepy. The animal would start up again and the barking was eventually coming from just feet outside my tent. I could make out a silhouette, but couldn't figure out what the animal was. A coyote? A dog? What would a dog be doing all the way out here? But coyotes don't sound like that... I sat up and leaned into the back of my tent with my little four-inch knife out. The animal creeped over to one side of my tent, I could hear it sniffing and moving around. The silhouette appeared in front of the tent, just a thin layer of bug netting between us. Adrenaline was pumping hard. Was I really going to have to deal with an aggressive animal three days into this trek?? Would I be able to handle it if it attacked? I said out loud, "If you come in here, you might win. But I'm gonna make sure you bleed too, buddy". The animal stopped moving toward the front of my tent. I sat still and waited. Eventually, the animal moved along, pausing for a couple more barking fits before it went silent for the night, leaving me to jump at every noise for the rest of the evening. A bird was building a nest in the tree directly behind my tent the entire night.... I really wish that little guy would've chosen a different night. I was shaken up and nervous, but my exhaustion took over and I fell asleep surprisingly easily. I was sure I was going to be up all night. I awoke to my alarm at 530. It was still dark, but I wanted to be in Julian by noon to meet up with Melanie. I packed everything up with my knife in my hand, nervous that the animal was still around. I was hiking at first light. I've never been so happy to see the sun. Camp near Chariot Canyon Rd. I can safely say, I never want to camp here again. Day 4: Chariot Canyon Road to Scissors Crossing (Julian). 13 miles. Taylor had the OG Polaroid camera out at Julian. Mel and I right off the trail. I stepped out the downhill/flat 13 miles in about four hours, fueled by motivation to see Melanie and apple pie. Morning hiking out from Chariot Canyon Rd. Another harmless snake out in the desert. Grateful that rattlers haven't been out much. I was definitely in the desert now. Long stretches of hot, dry, boring hiking... This section is one of the longest without solid water sources, around 36 miles. But I hear there's a water cache (water in coolers that people maintain) under the 78 overpass. Stretches like this basically connect the dots between much better hiking in California. You're not going to get out of southern California without hiking in some desert. Sometimes it feels strange being so far away from water. So unnatural, and kind of anxiety producing. But I've had more than enough water on me the whole way so far. I had eaten the last of my food earlier in the morning, so I was starving when I got to Melanie. Definitely going to load up on food for the next stretch. Mel, some homeless guy, and Taylor in Julian. I was picked up on the S-2 near Scissors Crossing by Melanie and our good friend Taylor who surprised me with a visit! We went into Julian and went straight to Mom's pie shop, where I'd heard that PCT hikers got free pie. I not only got free pie, but they comped my whole meal! (Which was basically just a crazy amount of pie and root beer floats) (It is TO a meal, Mom!). 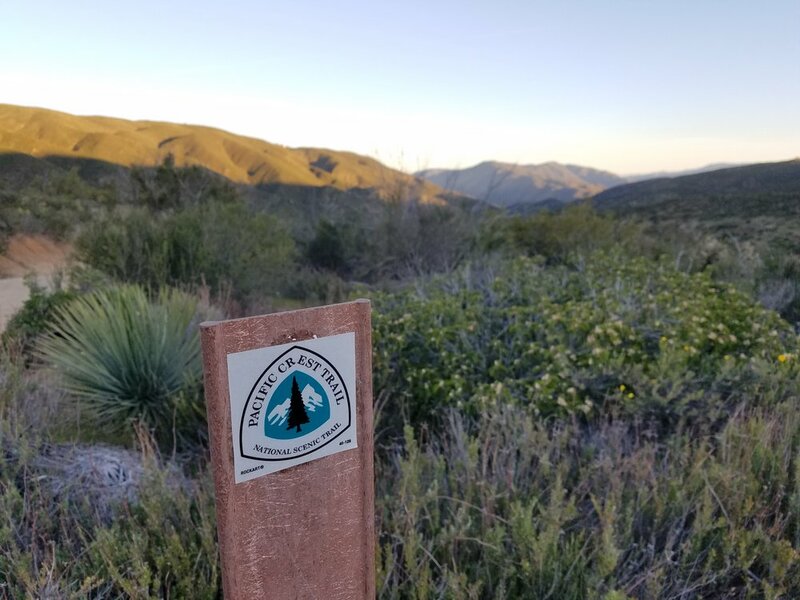 I signed their PCT logbook, met another couple of PCT'rs (Marble and Boston Chris) and spent the day just walking around Julian, but mostly (and most importantly) not walking.